AM and SSB was made legal to use (using approved equipment) on the European band ... so what does this mean to you? The usable range on a 'standard' CB on FM is around 4-7 miles vehicle-to-vehicle and upto 10-15 miles base-to-base with big aerials... SSB is MUCH more efficient than FM in terms of range ... the permitted output for SSB is also much higher - 12w compared to the 4w allowed for FM - this means you get a usable vehicle-to-vehicle range of upto 15-30 miles and maybe double that base-to-base !! Permitted power on AM is 4w, and while it is not as efficient as SSB, it's generally considered to be better than FM, it can increase vehicle-to-vehicle range by a couple of miles. The other big difference with SSB is that signals don't block each other out like they do on FM where the strongest signal on the channel is the only one you'll hear ... on SSB you'll hear everyone on that channel - on the calling channel this can lead to a 'pileup' with many voices being heard at the same time! You can bet someone will be slightly off frequency, so talking like pinky and perky, and someone else will be off frequency the other way, and sounding like a dalek! 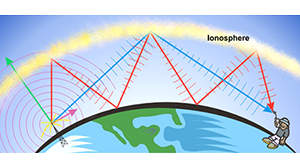 When transmitting on FM, your radio produces a constant signal (a "carrier") and adds your speech to it but on SSB the carrier is missing, the CB only transmits signal when you speak, so the CB's output meter or SWR meter if one's connected, will dance around in time to your voice. You can get a relatively steady output on SSB by whistling into the mic, so you'll hear quite a lot of that too, as people check their output power and tune up amplifiers etc ... it's impractical to check your SWR while on SSB, switch to FM on the same channel instead. This is where someone will call out on one of several calling channels for a long distance contact "CQ DX" stating where they are and inviting people to move to another channel for a contact ... this contact will often consist of just an exchange of signal reports, a quick rundown of the equipment each person is using, and if it's a particularly 'nice' contact, the exchange of PO box or web addresses so they can exchange a QSL card (similar to a postcard, with details of date, time, signal etc of the contact, traditionally sent through the post, but now also sent through e-QSL bureaus). 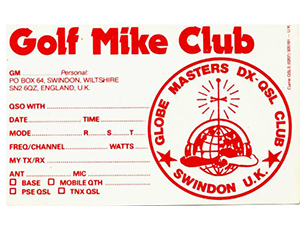 When i was into DX'ing on SSB in the 1980's and 90's, 3 of the 4 walls in my radio room (spare bedroom in my parents house) were covered in QSL cards - i made contact into 70 different countries, in every continent of the world, and QSL confirmed 43 counties - all on the CB radio! 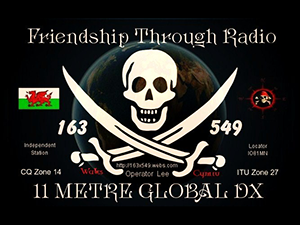 Due to the changeability of the phenomena that allows such long distance contacts, they rarely last more than a couple of minutes, and if they could, most DX'ers would prefer to cut the conversation short and get on with making the next contact! When conditions are right, contacts of many thousands of miles can happen easily! 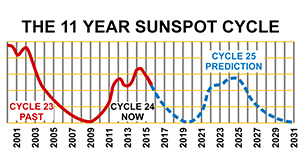 This is mainly governed by the 11 year sunspot cycle (a peak in the solar emissions of the sun, every 11 years) ... again we won't got into the technical stuff but basically, this charges up the particles high up in the ionosphere which makes them reflect radio signals instead of letting them pass through, out into space. 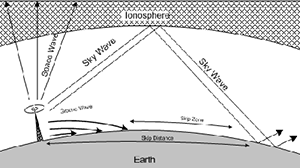 This means that signals can be reflected back, beyond the horizon and can sometimes even bounce around in the ionosphere or reflect back off the ground and "multi-hop" contacts can be made to the other side of the world. SOUNDS GOOD, SO HOW DO YOU GET AM & SSB? The new AM/SSB legislation only permits the use of new and approved CBs, NOT old 'legacy' multimode radios like you'll find on ebay, and NOT the current crop of fancy looking new multimode radios from China. we expect to see more type-approved SSB CB's in the future but for now there's just these, fortunately they're both cracking radios! 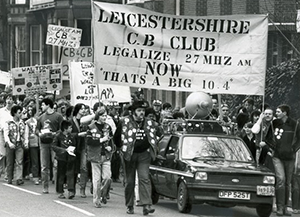 Before UK CB's legalisation in 1981, the CB users that lobbied for it's legalisation - marching on the house of commons etc, were campaigning for legalisation of the AM 40 channels they were already illegally using ... mainly with imported American radios and the like. These are the same channels that we now call the EU or EC or European band, and are used on AM in most countries of the world where CB exists. 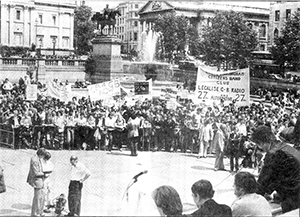 Not many people were happy when an FM service on slightly different channels was made legal (the UK band we all use now), as many considered FM to be inferior to AM. 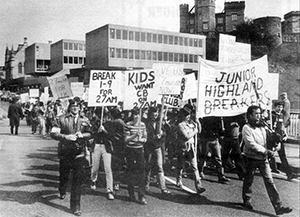 34 YEARS LATER, WE FINALLY GET WHAT THEY WERE CAMPAIGNING FOR !